The passenger’s front air bag can be deactivated by the passenger’s front air bag ON/OFF switch if a child restraint is installed on the front passenger's seat or if the front passenger's seat is unoccupied by a person. To ensure the safety of your child, the passenger’s front air bag must be deactivated when it should be necessary to install a rearward facing child seat on the front passenger seat in exceptional circumstances. To deactivate the passenger’s front air bag, insert the mechanical key into the passenger’s front air bag ON/OFF switch and turn it to the OFF position. The passenger’s front air bag OFF indicator ( ) will illuminate and stay on until the passenger’s front air bag is reactivated. 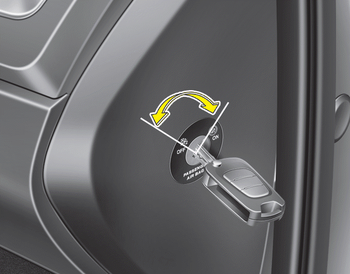 To reactivate the passenger’s front air bag, insert the mechanical key into the passenger’s front air bag ON/OFF switch and turn it to the ON position. The passenger’s front air bag OFF indicator will go out and the passenger’s front air bag ON indicator ( ) will illuminate for approximately 60 seconds. On some models, the front air bag ON/OFF switch could turn by using a similar small rigid device. Always check the status of the front air bag ON/OFF switch and passenger's front air bag ON/OFF indicator. When the passenger’s front air bag ON/OFFswitch is set to the ON position, the passenger’s front air bag is activated and child or infant seat should not be installed on the front passenger seat. When the passenger’s front air bag ON/OFF switch is set to the OFF position, the passenger’s front air bag is deactivated. If the passenger’s front air bag ON/OFF switch is not working properly, the air bag warning light ( ) on the instrument panel will illuminate. And, the passenger's front air bag OFF indicator ( ) will not illuminate (The passenger's front air bag ON indicator comes on and goes off after approximately 60 seconds), the SRS Control Module reactivates the passenger’s front air bag and the passenger’s front air bag will inflate in frontal impact crashes even if the passenger’s front air bag ON/OFF switch is set to the OFF position. If this occurs, we recommend that the system be inspected by an authorized Kia dealer. If the SRS air bag warning light blinks or does not illuminate when the ignition switch is turned to the ON position, or if it illuminates while the vehicle is being driven, we recommend that the system be inspected by an authorized Kia dealer. The driver is responsible for the proper position of the passenger’s front air bag ON/OFF switch. Deactivate the passenger's front air bag only when the ignition switch is switched off, or the malfunction may occur in the SRS Control Module. And there may be a danger that the driver's and/or front passenger’s and/or side and curtain air bag may fail to trigger, or not trigger correctly during a collision. Never install a rearward facing child seat on the front passenger's seat unless the passenger's front air bag has been deactivated. The infant or child could be severely injured or killed by an air bag deployment in case of an accident. Even though your vehicle is equipped with the passenger's front air bag ON/OFF switch, do not install a child restraint system in the front passenger's seat. A child restraint system must never be placed in the front seat. Children who are too large for child restraint systems should always occupy the rear seat and use the available lap/shoulder belts. Children are afforded the most safety in the event of an accident when they are restrained by a proper restraint system in the rear seat. 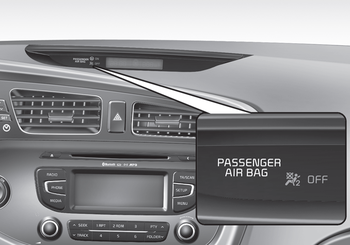 As soon as the child seat is no longer needed on the front passenger's seat, reactivate the front passenger's air bag. Never place or insert any object into any small opening near side airbag labels attached to the vehicle seats. When the air bag deploys, the object may affect the deployment and result in unexpected accident or bodily harm. No objects (such as crash pad cover, cellular phone holder, cup holder, perfume or stickers) should be placed over or near the air bag modules on the steering wheel, instrument panel, windshield glass, and the front passenger's panel above the glove box. Such objects could cause harm if the vehicle is in a crash severe enough to cause the air bags to deploy. Do not place any objects over the air bag or between the air bag and yourself.